From growing up together, to sharing life’s roller coaster journey, making it all more tolerable, more exciting and more fun, thanks to your bestie; Ransom Riggs quite aptly describes friendship. However, caught up in our busy lives, we sometimes tend to take this special person for granted. 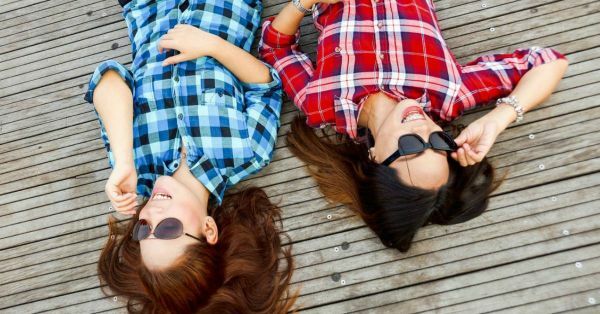 Let’s all vow to change that in 2018 and check off a bucket list of 18 things we can enjoy together with our best friend to feel closer. Read on and get down to striking them off already. Don't forget to tag your bestie along. Netflix and chill can be super fun in your best friend’s company! Select a TV show that the both of you have been wanting to watch for a long time. All you need is a tub of popcorn, a comfortable duvet, a good sitcom to binge watch and tons of entertainment with each other. Friendship goals right there. There is something special about just lying under the dark sky and gazing at the stars. Plan a night to lay and gaze at the stars while sipping wine, till sunrise. Conversations, a starlit sky and wine, and voilà, you have all the ingredients for an amazing night out together! Whether it’s artwork, badminton or something as crazy as cocktail-making; taking up a hobby with your bestie is a superb way to learn a skill and do it in the company of someone fun. Sounds like quite a plan, doesn’t it? Hint: Some may even consider shopping as a hobby, and we’re no one to complain! Good music brings people closer. Raging and screaming your guts out as you sing your favourite songs could be just the kind of night you need with your bestie. Once in a while, it’s great to let loose and enjoy a crazy concert night out. From matching your outfits to your bags and make-up, it’s high time you spend one whole day twinning with your bestie. Go to the mall, watch a movie or just hit one of your favourite coffee places in town. Let the world know and watch as the two of you are about town, twinning together! That ‘Dil Chahta Hai’ trip to Goa left us all feeling super envious of and hoping to plan an impromptu adventure of our own someday. Make that desire a reality and embark on a fun and adventurous trip with your best friend. Travel and explore a new place in each other’s company and create memories that will last a lifetime. A big part of bonding in real friendships is communicating honestly with each other. Take time out and talk about your fears, dreams, insecurities and feelings with one another. Speak your heart out because it is moments like these that bring you closer to someone. “It’s a big world out there, go and explore.” Do you know what would be even better ? To plan an exploration day out, learning about your city, visiting a monument, and an old café in the company of your favourite person in the whole world. Start reading the same book together, and share your thoughts and views with each other along the process. You won’t just end up devouring the book quickly as you read simultaneously. Plus, it will feel like you are living the story together. How often does that happen? Friends that laugh together, stay together! So, why not plan to go for one a stand-up comedy show, or extend the fun to a jazz night out with your best friend? What fun would it be to sip on a few cocktails and laugh your hearts out while you’re at it? You and your bestie have been together for as long as you can remember. With all of life’s highs and lows that you’ve shared with each other, you’ve both come a long way. What fun would it be to create a timeline, or a collage of all your fun (and naughty) memories together! Working out is tedious and often feels like a chore. But to stay fit and look hot, a girl has got to do what a girl has got to do. Doing things in the company of your girlfriend can make it a really fun exercise, pun intended. They say you really only get to know someone only when you live with them. So, take a few days out and try out something interesting. Move in with your best friend and test the strength of your friendship. Running marathons is all about becoming fit, regulating your diet and sweating it out. Little did you know that it could be a splendid way to bond with your best friend. It’s an opportunity to do something fun together. Plan training sessions together, chart out a diet that you both will follow and run a marathon together. The sense of having achieved something together by the end of it will truly be worth it. Rewind to your teenage years and get ready to get your feet tapping. Listen to all those Taylor Swift, Avril Lavigne and Eminem hits, reminisce all those memories and create a dance routine to your favourite songs. This could be a great way to appreciate how you’ve grown with each other and it’ll just be a super fun thing to do together. As well as you know your best friend, you need to know their partner, too. The best way to keep things fun and light is to go on a double date and enjoy your time as couples together. Going on a diet can be quite a task given the fact that the world is full of delicacies like chocolate brownies, tiramisus and red velvets. But, what the hell?! Get your bestie on board and vow to go on a diet together. When you’re both doing it together, being each other’s emotional support can make it worth the efforts. Once the alcohol goes in, exciting times begin. Have a PJ party with your bestie, drink till you pass out and in the process, dance, do some karaoke, and speak out to your heart’s content. Trust us, it’ll be a night to remember, if you remember anything at all.